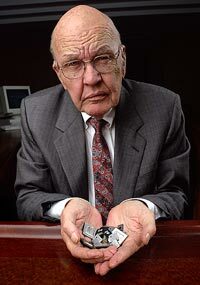 Jack Kilby, inventor of the integrated circuit. Rob Noyce is considered to have invented the integrated circuit about the same time as Jack Kilby. Integrated circuit and Jack Kilby who patented it when he was at Texas Instruments. I know the top one is the first Integrated Circuit. So the bottom must be Jack Kilby.